Say goodbye to your old ugly metal (amalgam) fillings! The days of ugly metal (amalgam) fillings are long gone. Although they still exist, we have so many more cosmetically pleasing options of which White Composite Fillings / White fillings are one! Composite is a filled resin material with almost the same workable characteristics as clay, making it easy to shape teeth almost any way we like. 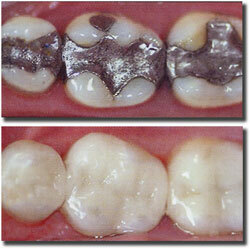 As in the photo, metal (amalgam) fillings are replaced by white composite fillings. Restoring small to medium-sized cavities. Closing food traps that cause irritation and gum problems. Although these white composite fillings are more prone to staining and chipping than more expensive options, they provide excellent results and repairing them is just as easy!